When the market is up, investors will pay less attention to the total costs of their investments since the returns are positive, but when the market is down, many investors become more interested in how much they're paying for their investments. Common sense tells us that if the gross return and the holding period are the same for two similar investments, the investment with the higher expenses will typically lead to lower net returns. Understanding the type of expenses incurred in relation to an investment will help investors choose the most efficient investment for them. Loads are fees that a fund uses to compensate brokers or other salespeople for selling the mutual fund. Loads can be as high as 5%. If you invest $10,000 in a mutual fund with a 5% front-end load, $500 will pay for the sales charge, and $9,500 will be invested in the fund. There is little to no evidence that exhibits a correlation between load funds and superior performance. Common sense then would tell us that staying away from “loaded funds” is better for your financial health. Commissions are basically another form of a load and they are common with actively managed mutual funds and are commonly classified as Class A, B or C. A funds designated class has nothing to do with the quality of the fund; instead, it merely signifies how the load (i.e., commission) will be paid to the broker. Class A funds charge an upfront fee (typically 5.75 percent or higher). Class B shares charge a back-end load or surrender penalty if the investor leaves the investment too soon, often covering several years. Class C funds charge a level load; that is, they constantly charge a commission. Please note that these loads or commissions are paid regardless of how the actual investment performs. • The cost of hiring the fund manager(s) - Also known as the management fee, this cost is between 0.5% and 1% of assets on average. Index or passively managed funds do not typically hire fund managers and, therefore, incur lower costs than an actively managed fund. • Administrative costs - These include necessities such as postage, record keeping, customer service, etc. • The last part of the ongoing fee is known as the 12B-1 fee. This expense goes toward paying brokerage commissions and toward advertising and promoting the fund. On the whole, expense ratios range from as low as 0.2% (usually for index funds) to as high as 2%. The average equity mutual fund charges around 1.3%-1.5%. Taxes – for taxable funds, the more trading a fund engages in, the more potential gain will be distributed to its investors. 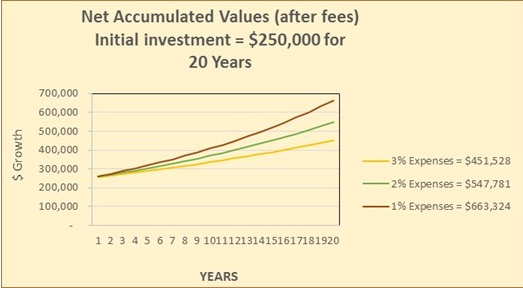 A solution for most high-net-worth individuals: a fee-only adviser — no loads, no commissions (not merely fee-based or part fee and part commission), serving as a fiduciary (and not buyer beware with mere suitability requirements), investing in institutional investments as opposed to retail investments (Class A, B, C and so on), and possessing substantial experience, qualifications and education.